Juicebox media venture VOX DOT COM came about after the Washington Post declined Ezra Klein’s request for an "eight-figure" investment. Enter General Electric, the proud corporate sponsor of VOX DOT COM. The sponsorship is part of GE’s #pressing campaign to promote "unique views on policy, from the best in the news," and readers are reminded of this every time they watch an explanatory video on the website. 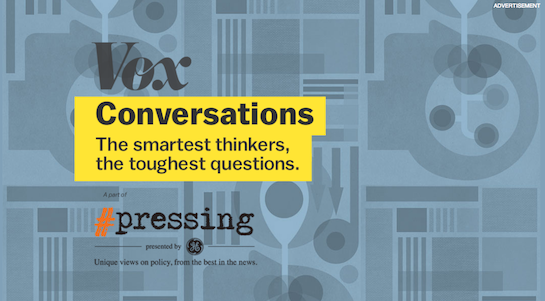 The #pressing campaign has its own website, the launch of which appears to have coincided with the launch of VOX DOT COM. It features content from VOX, Slate, Politico, CNN, Fox News, and NBC News (which used to be owned by General Electric). But however much GE is paying the juicebox brigade to publish context-free musings about the NBA and discuss income inequality over $16 cocktails at the St. Regis Hotel, it's a savvy investment. These issues—specifically those relating to environmental policy/transportation/global warming—and the policy solutions they imply (Explanation: MORE GREEN ENERGY! 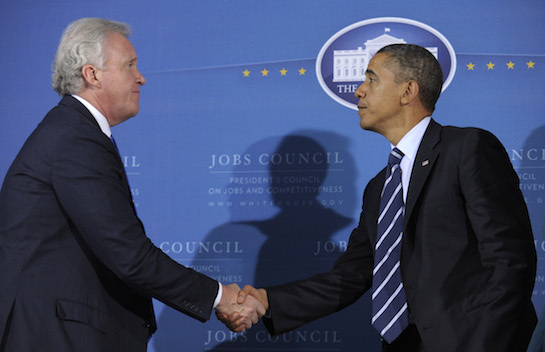 ), also coincide with the business interests of General Electric, a company whose current CEO, Jeffrey Immelt, was tapped by President Obama to lead the White House Council on Jobs and Effective in 2011. After generously backing President Obama and Congressional Democrats in 2008, General Electric received more than $200 million in taxpayer funding as part the stimulus package of 2009, much of which went toward green energy projects such as bird-killing wind turbines. The company received billions more indirectly through grants for other green projects, such as power-grid modernization, by selling GE equipment to the recipients of those grants, many of which were already did business with GE. In the early years of the Obama administration, General Electric lobbied furiously for climate change related legislation, including cap-and-trade, because few other companies stood to benefit as much as GE did from stricter energy regulations. GE, under CEO Jeff Immelt, has invested significant financial and human capital in an effort to expand its share of markets for clean (or cleaner) energy technology such as wind turbines. The company’s bet was that government policies aimed at cutting carbon dioxide emissions would lead to rising demand for energy generation systems that didn’t involve burning coal — technology GE could supply at a healthy profit. Right now, however, demand for GE’s renewable energy gear has hit a downdraft. GE said in a presentation this morning that revenues for its "power and water" sector, which includes its clean energy systems businesses, fell by 26%, and profits in that segment dropped by 39%. Weakness in Europe (revenue down 22%) didn’t help. "Wind" revenue fell by 53%, GE said. Uncertainty about the future of U.S. wind power tax credits may have pulled some orders into the latter part of 2012. But cheap natural gas in the U.S. represents a longer term challenge to renewable technology demand. 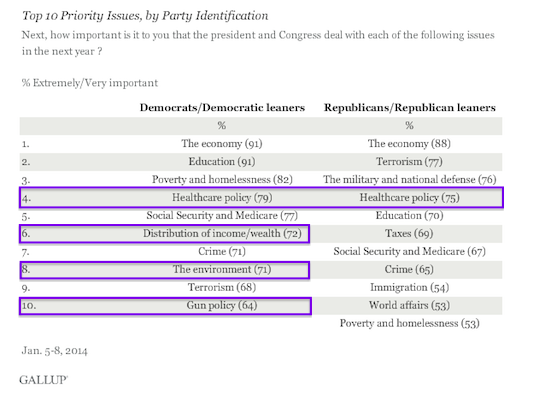 So it would be great if someone could help put climate change "action" (explanation: More investment in green energy technology, such as the GE wind turbines featured in those #pressing ads) back at the top of the Democratic agenda. Enter VOX DOT COM, among others. Explainer-in-Chief Ezra Klein's introductory essay, "How politics makes us stupid," devotes a lot of time to explaining why people (conservatives) who don't agree with Ezra Klein on climate change ("action is needed quickly to prevent a disaster") are endangering the lives of future generations. In one of the first interviews published on VOX DOT COM, Klein and environmentalist author Elizabeth Kolbert discuss how the human race may be warming itself into extinction. Executive Explainer Matthew Yglesias made a video explaining why we should all "stop freaking out about the debt" and start focusing on more #pressing concerns … like climate change. Interested in the Keystone pipeline debate? 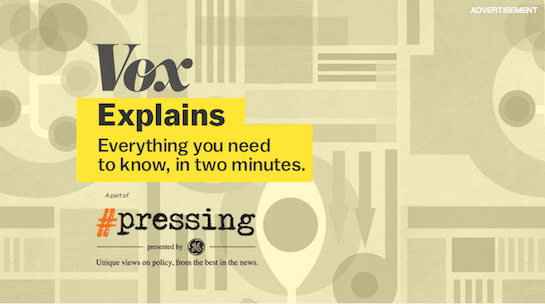 VOX DOT COM/General Electric has a two-minute explainer (1:46 to be exact). Ironically, the video is guilty of the very sin that VOX DOT COM was supposed to rectify: it does little more than present both sides of the argument, minus the "crucial context" that we all crave. "Oil companies and the Canadian government want the pipeline approved." "Building the pipeline would also create thousands of temporary construction jobs, which may be one reason why the proposal polls well in the United States." Got it? Oil companies want the pipeline, which mysteriously merely "polls well" among the American public, more than 60 percent of which supports construction. Anything about how Keystone would affect domestic oil production or otherwise benefit the economy? Nope. "Environmentalists on the other hand, want Obama to block the pipeline." The video notes that a recent State Department report found that the environmental impact of building Keystone would be minimal because "even if it was blocked, most of the oil would just get shipped by rail anyway." However, "green groups are disputing that analysis and the argument continues." What about the context? Is the analysis correct? Are the green groups right to dispute it? Or are they just complaining because it doesn't conform to their worldview, thus exhibiting the confirmation bias that Ezra Klein warned us about? Is there a political angle? Who is Tom Steyer? VOX DOT COM declines to explain. This entry was posted in Issues and tagged Climate Change, Ezra Klein, General Electric, Green Energy. Bookmark the permalink.